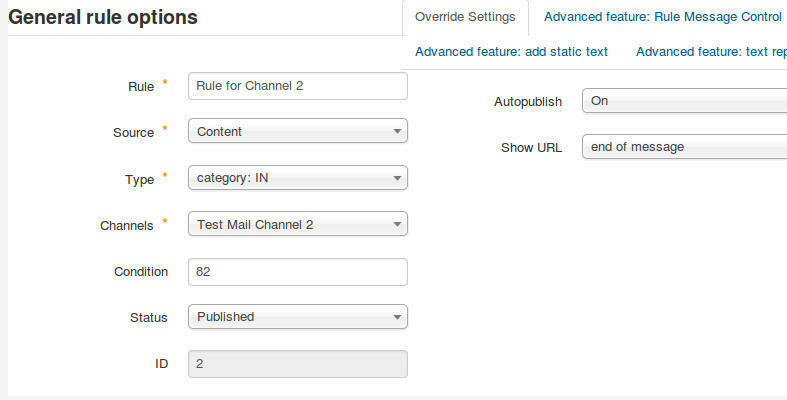 Advanced Rules: Engine Mode "Posting to selected channels only"
If you are looking for a way to simply publish content from some categories or exclude some categories, most plug-ins have a "Filter" to define included/excluded categories. 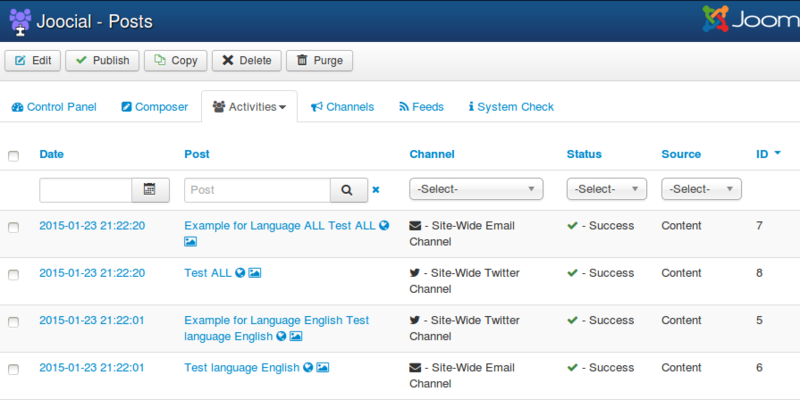 Firstly, check the associated plugin, "Filter" tab, to filter by category. 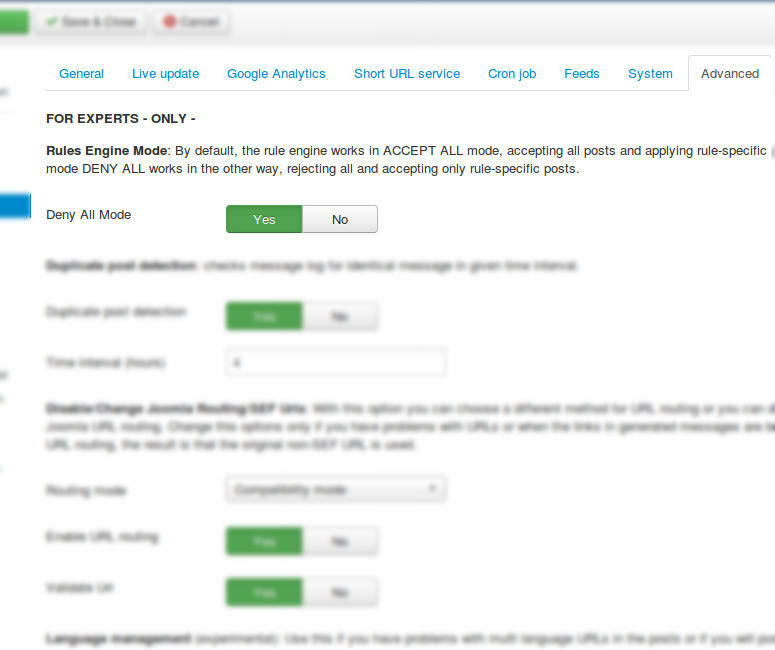 Moreover, this option avoids any further processing, not generating new requests. 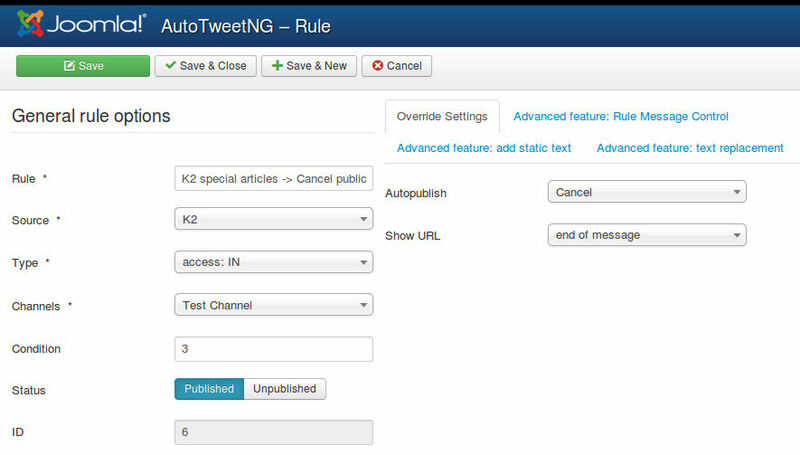 You can access this feature by clicking on Rules in the toolbar links area of AutoTweetNG or Joocial . 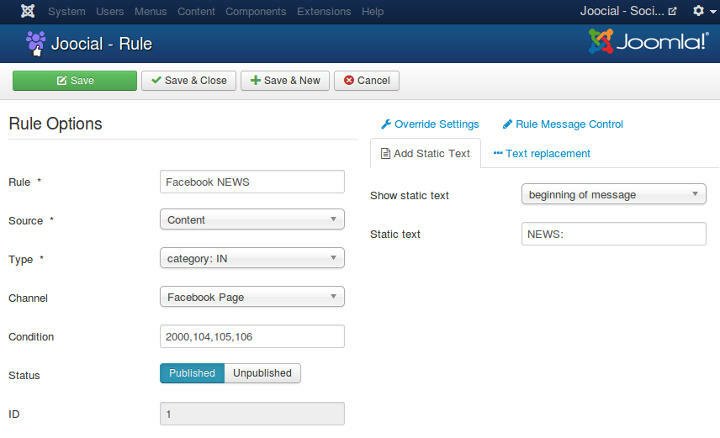 Some cases can be solved just with a filter at content plugin level, but in this section, solutions based on rules are presented. 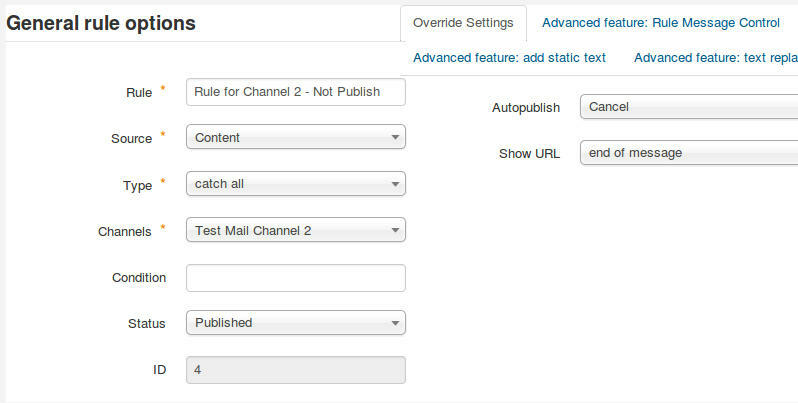 Rules allow selecting plugins and channels to post by category, text terms, author and more. Rules are only needed when you will do particular posts. If you will post messages to all channels there is no need to add rules. 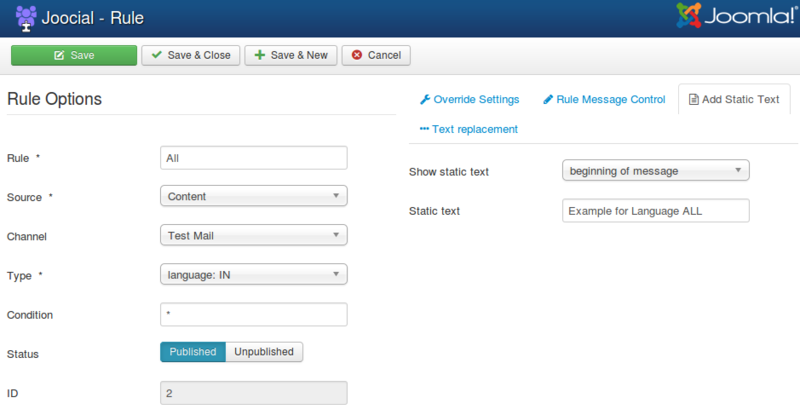 The rules engine works processing requests from the list to create posts, when they are on the way to the social channels. New: operation to create a new rule. Edit: a rule can be edited to modify its attributes. 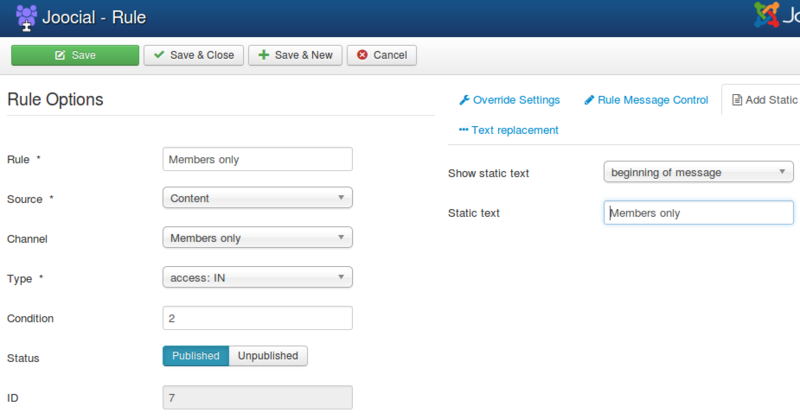 Publish / Unpublish: operations to either publish or unpublish rules. Unpublished rules are not executed. Copy: a rule can be copied, to be duplicated. For example, to create a similar rule for each channel. Delete: a rule can be deleted to avoid any further processing. Rule name *: only informational. Source *: which integration plugin this rule applies. Autotweet as source refers to manual posts created by Autotweet itself. Type *: rule type to be applied in the execution. Condition: some rule types require an additional parameter. For example: category: IN requires a list of category IDs 11,22,33,44. Channel: which channel this rule is applicable in. If empty (the "- Select -" pseudo-option of the channel list) it applies to all channels. The following rule types are executed only if the article attribute is either included or not in the associated list of values. Additionally, "Only Featured" filter allows restricting the rule to featured content. More information: User activities are published into User Channel AND Site-Wide Social Channels, why? These are the parameter than can be controlled and modified by a rule. 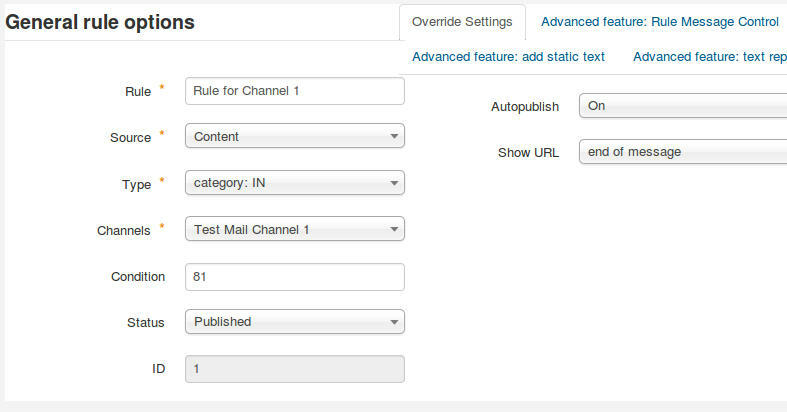 Autopublish: to choose if the message has to be auto published (Yes) or not. If not, Off sends the Posts to Pending state, waiting for manual publishing, or Cancel to prevent any further processing. Show URL: to choose if the Url has to be either included in the message or not, and where, beginning of message or end of message. Static text can be introduced, or removed if it was previously introduced, in the message. Show static text: to choose if the message has included a static text (beginning of message or end of message) or not (Off). Static text: a static text that is inserted into the message. You can use this also for hashtags. Regular expression: enter a regular expression to remove or replace parts of the message text. PHP preg_replace function is used. The expression can be a JSON array. Replacement text: Enter the replacement text for the regular expression. PHP preg_replace function is used. If the field is empty, the text parts are removed from the message text. The word autotweetng is always replaced with #AutoTweetNG, ignoring case. Similarly to the previous example, but for two words. In this case, the rules help to route the content between two channels. Each channel must receive and publish only the articles from its associated category. 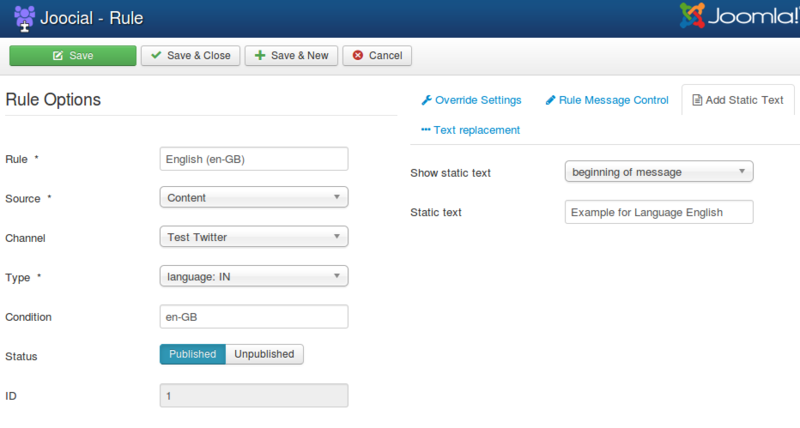 By default, AutoTweet broadcasts the content Requests to all Channels. So, the rules must publish the articles from a category to its channel, and discard everything else received in the channel. In the image, the post for Channel 1 was successfully processed, and the post for Channel 2 was canceled. In case, you are wondering if there is a way to avoid the "canceling" rules, YES, there is. You can enable DENY ALL mode . 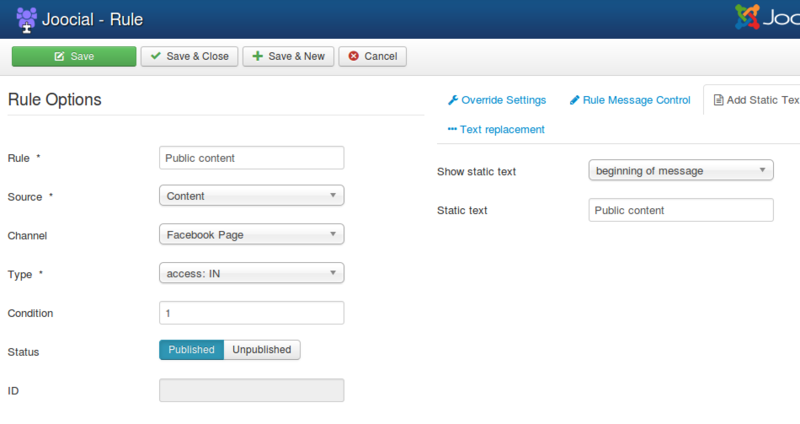 In this mode, no post will be published unless you define specific rules to publish posts. When we publish articles in different languages, they are routed according to the selected language. When articles are published by different access level, they are routed according to the target audience. 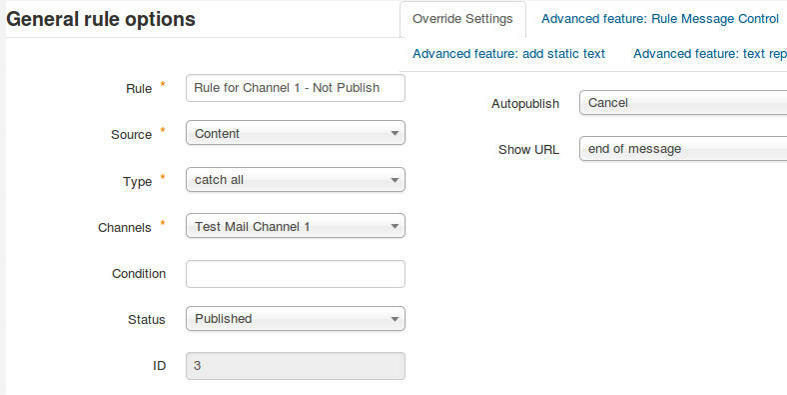 # Advanced Rules: Engine Mode "Posting to selected channels only"
By default, the rule engine works in ACCEPT ALL mode, accepting all posts and applying specific rules to the source-channel combination. On the other hand, if you want to publish content under very specific conditions, more content has to be canceled than published. In this case, DENY ALL is the most convenient option. The advanced mode DENY ALL works in the other way, rejecting all and accepting only rule-specific posts. A rule must be created to publish content in a source-channel.